COLUMBUS, Ohio (WCMH) - Another large spring storm is hitting the Southern states, only days after tornadoes raked areas from Texas to Alabama northward to Ohio and Pennsylvania last weekend. A line of powerful thunderstorms spawned deadly tornadoes in Mississippi Thursday evening, killing two drivers, and a woman in Alabama also died, accoring to AP. More than 100,000 people lost power from Texas to Alabama as several squall lines pulsed eastward. There were more than 200 reports of severe weather Thursday across the Deep South, including up to 10 tornadoes in Mississippi, pending field surveys by the National Weather Service today. 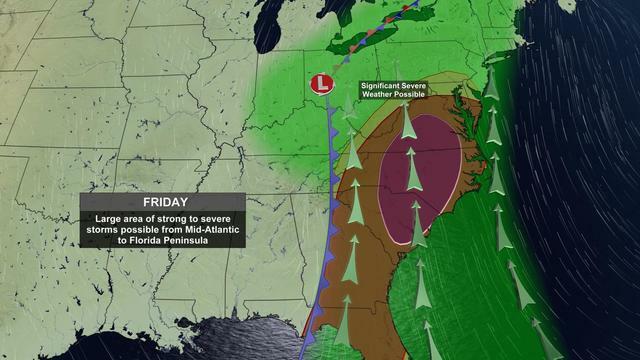 Strong storms are expected to develop in the Southeast and Mid-Atlantic region, from Florida to Virginia Friday as low pressure trundles up the west side of the Appalachians, bringing heavy rain to the east, and unseasonably chilly temperatures in the Ohio and Tennessee Valleys on the back side of the storm. The parade of storms coming in from the Pacific as disturbances in the jet stream have been able to tap an ample supply of tropical moisture linked to the Madden-Julian Oscillation (MJO), a cyclical storm pattern. Discovered in 1971, the MJO describes a linkage between atmospheric circulation and deep, tropical moisture with eastward-moving waves of thunderstorm clusters. Stormy phases typically last from 30 to 60 days, followed by a similar period of quiet weather associated with sinking, drying air. An unusually active subtropical jet stream has prevailed since last year, which turned into our wettest on record in Columbus, with 54.97 inches of precipitation (rain and snow). One station in the Hocking Hills received more than 65 inches of moisture. 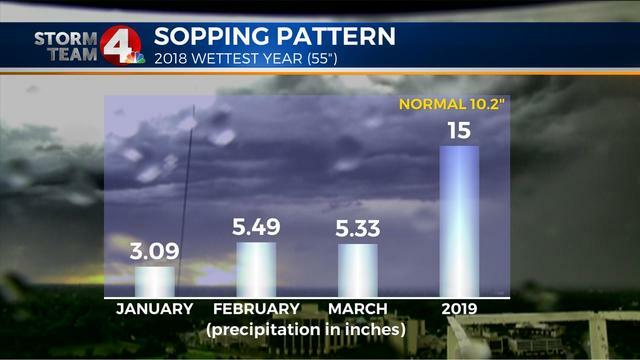 So far in 2019, Columbus has received a little more than 15 inches of precipitation, including more than an inch in April, about five inches above average. A chilly rain will linger through Saturday, possible mixed with a couple of wet snowflakes over the southwestern and central part of the state, as a cold pocket of air aloft moves over the region. Saturated soils has made it increasingly difficult for farmers to work into the field at the start of planting season in mid-April following a wet autumn last year, which halted fall tillage and aerial applications of fertilizer. Further damage was done by erosion from heavy rain and a freeze-thaw cycle in places where water ponded in low-lying fields over the winter. Frost heaving forced plants to rise up out of the ground, leaving roots exposed to the elements. An absence of snow cover provided little cover or insulation for winter crops.